Ontario's Premier Kathleen Wynne sits next to Finance Minister Charles Sousa as the provincial government delivers its 2018 Budget, at the Queens Park Legislature in Toronto, on March 28, 2018. The Ontario Liberals are on a radically different fiscal path. 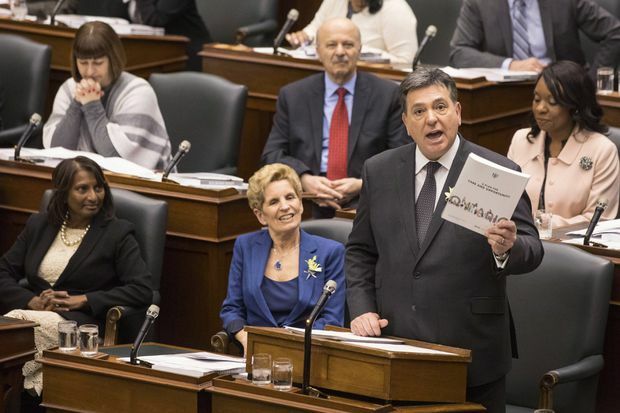 Finance Minister Charles Sousa tabled a budget on Wednesday that includes billions of dollars in new spending and a $6.7-billion deficit – the first of six consecutive shortfalls, according to the government’s new fiscal road map. With her party languishing in the polls, Premier Kathleen Wynne is abandoning a balanced-budget pledge and spending big ahead of June’s election. Many of the government’s centrepiece policies – notably, a plan to provide fully government-funded child care to preschoolers – were announced in the days leading up to the budget. But the document still includes several new proposals, including a change to personal-income tax brackets. Here are 10 things you need to know about the Ontario budget. After a single year in the black, Ontario is heading back into a deficit. Should the Liberals be re-elected, it would stay that way for the foreseeable future. The government has tabled a $6.7-billion shortfall for fiscal 2018-19 and projects a return to balance by 2024-25 – beyond the next four-year election cycle. Despite the province’s solid economic footing, its debt burden is set to increase in the coming years. The net debt-to-GDP ratio is projected to finish the current fiscal year at 37.1 per cent, slightly better than forecast in the government’s fall update. But over the next three fiscal years, it is set to rise, reaching 38.6 per cent in 2020-21 – within a percentage point of a peak reached in the aftermath of the global financial crisis. In total figures, net debt is projected to hit $325-billion in the fiscal year 2018-19. The Liberals had previously targeted reducing the debt ratio to prerecession levels by 2029-30. In a move that would affect millions of Ontarians, the government is proposing to simplify personal-income tax brackets and eliminate Ontario’s personal-income surtax. Under the current rules, a person earning $95,000 in Ontario pays $6,946, or 7.31 per cent, in taxes. Under the simplified brackets, they would pay $7,114, or 7.49 per cent, an increase of $168 a year. The changes would come into effect July 1 and affect almost 2.5 million people. An estimated 1.8 million taxpayers would pay an additional $200 a year, on average, while another 680,000 would see their taxes reduced by an average of $130. The changes would generate an additional $275-million for the province in 2018-19, growing to $295-million by 2020-21. Starting in the fall of 2020, licensed child care would be fully government-funded for preschoolers from the age of 2½ until kindergarten. As announced on Tuesday, the plan would cost $2.2-billion over three years. The government says the average Ontario family with a preschool-age child could save more than $17,000. The government is proposing a new drug and dental program for those without extended health coverage. Starting in the summer of 2019, it would cover as much as 80 per cent of eligible prescription drug and dental expenses each year, to a maximum of $400 for a single person, $600 per couple and $700 for a family of four with two children. The program would cost $800-million over three years. Separately, in the days preceding the budget, the government announced an expansion to its OHIP-plus pharmacare program. The program currently allows eligible children and youth 24 and under to get free prescription drugs. As of Aug. 1, 2019, those benefits would be extended to seniors. The Liberals unveiled a new program that would help seniors offset the costs of household maintenance. Costing $1-billion over three years, the program would provide a benefit of as much as $750 a year for eligible households led by a senior 75 or older. It would go into effect sometime in fiscal year 2019-20. Details of the program – notably, the expenses that would be allowed – are forthcoming. The province has promised $547-million over five years for repairs and retrofits to affordable and social housing stock. The retrofits will focus on energy efficiency, making the housing stock more sustainable and improving living conditions. Ontario has also pledged roughly $200-million over three years as the provincial share of the recently announced federal national housing strategy. The investment includes funds for an affordable housing benefit, repairs to existing units and construction of new housing units. The government is investing $500-million over three years in a bid to enhance broadband in northern and rural communities. Included in the commitment are specific investments aimed at improving Eastern Ontario’s cellular coverage and funds to support the development of a satellite network that will provide internet access to remote communities. As a response to a Globe and Mail investigation into securities fraud, in late December Ms. Wynne vowed to examine what could be done to curb problems in securities enforcement. The budget proposes a series of new tools that would enhance the powers of the Ontario Securities Commission, the province’s capital-markets regulator. The government would create new offence categories for people and companies found to be in breach of existing sanctions. The OSC would also have the ability to automatically reciprocate certain sanctions imposed by other Canadian securities regulators, and the regulator would streamline both the administrative penalty process for first-time violators and information-sharing processes with other regulators. The Globe investigation into the state of securities law enforcement in Canada revealed a system that allowed convicted fraudsters to reoffend with relatively few repercussions. The amount of unpaid fines for securities crimes in Canada had surpassed $1.1-billion. The budget promised a fare reduction to $3 for GO transit trips of less than 10 kilometres. These fare reductions would apply to all GO trips within the city of Toronto, potentially saving riders hundreds of dollars a year. The province will also kick off discussions on whether the City of Toronto should upload the ownership of subway lines to the province. Cannabis: The budget includes government forecasts on cannabis revenue. By 2021, the province expects to be making $215-million a year from sales through the Ontario Cannabis Retail Corporation and a portion of federal taxes. Credit reports: In a nod to last year’s Equifax data breach, in which credit histories for thousands of Canadians were stolen, the government will make online access to credit scores free twice a year. They’ll also require agencies to implement credit freezes when asked and will require agencies to disclose which third parties have accessed a consumer’s score in the past 12 months. The province would increase hospital funding by $822-million in the coming fiscal year to help reduce wait times, among other issues. The budget commits an additional $2.1-billion over four years to mental health and addictions services funding.